Look out! Here comes Matilda! The American Staffordshire Terrier races by, gallops around the apartment for a few minutes, then collapses for a nap on the couch. 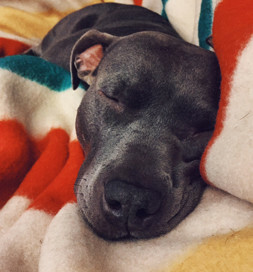 Her fosterers called it her “pit fit.” Now it’s one of the quirky habits that endears her to Mike Duesenberg, who adopted her after first glimpsing her on Petfinder. A little snooze is always refreshing. It shows the enthusiasm for life packed into the body of this adolescent dog, who once roamed the streets of Chicago. Animal control picked her up, and New Leash on Life Chicago took her in and placed her in a foster home. Mike didn’t decide to adopt a dog on a whim. He had been looking for the perfect match for about a year. “I didn’t want to be overly picky, but I also wanted a dog that I could involve in all aspects of my life.” That included family events, road trips and active weekends. Over the course of the year, he filled out many applications. Other people snapped up some of the dogs he applied to adopt; some weren’t the right fit when he met them. “I was scrolling Petfinder one day and came across Matilda,” he says, “and it was a gut reaction to just fill out an application right away. “ And he struck gold. “After meeting her, there was no hesitation in my mind,” he says. “It was actually hard for me to believe she hadn’t been adopted yet.” From her photos on Petfinder, he had surmised she was a sweet dog. “After meeting her in person, she was even more loving than I thought. She instantly came up to me with her tail wagging.” He admits she does that to everyone, but it was enough to win him over. She adjusted to her new home quickly. “The first night she made herself right at home,” he says. He believes patience is the key to a successful adoption. “Be patient with the process of finding a dog, the process of adopting a dog and the process of having the dog become comfortable with you and his or her new home. There’s a huge payoff at the end.” The proof is in Mike and Matilda’s bond.